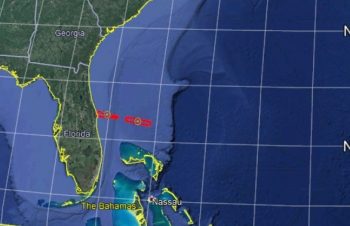 United Launch Alliance’s clandestine Atlas V launch in support of the US National Reconnaissance Office finally departed SLC-41 on Sunday, after previously failing to dodge bad weather and then suffering a telemetry transmitter issue. 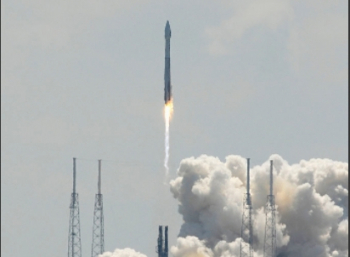 Liftoff of NROL-52 from the Cape Canaveral Air Force Station occurred at 07:28 Eastern. Following an earlier scrub after several attempts to find a gap in the weather, ULA was aiming to attempt another launch last Saturday. However, a hardware issue delayed the mission several hours ahead of the launch window opening. With the issue fixed, the vehicle rolled back to the pad was preparing for Saturday’s attempt. However, high ground winds resulted in another scrub, with the next attempt moving to Sunday. The launch – which is only broadcast to fairing jettison – is carrying out the NROL-52 mission for the National Reconnaissance Office (NRO), deploying an unspecified payload into Earth orbit. The sixth flight of Atlas this year, this launch followed the successful deployment of the NROL-42 mission – whose payload is now designated USA-278 – from Vandenberg Air Force Base in late September. 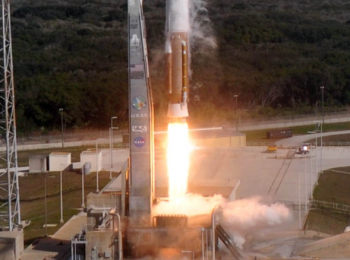 The NRO rarely releases any details of its spacecraft, and NROL-52 – or NRO Launch 52 – is no exception. 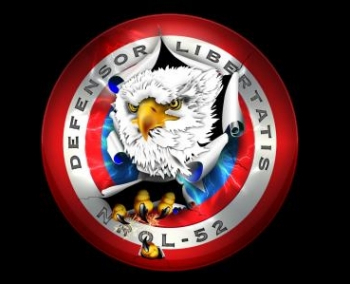 Officially, NROL-52 is a classified mission being conducted in the interests of national security. Despite this secrecy, experts and amateur observers are often able to identify different classes of spacecraft, track the satellites in orbit and make deductions about their missions and some of their capabilities. These deductions have been aided by occasional leaks from within the US intelligence community – such as documents released by Edward Snowden to the Washington Post in 2013 that revealed the names and budgets of many of the NRO’s satellite programs. 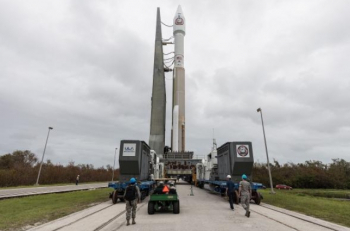 As the launch is taking place from Cape Canaveral, it is unlikely to be carrying an imaging satellite. Optical imaging payloads typically use a near-polar sun-synchronous orbit which provides consistent lighting conditions and allows a satellite to observe most of the planet’s surface, while the current-generation Topaz radar-imaging satellites use a retrograde orbit, flying east-to-west around the planet. Neither of these orbits can easily be reached from Cape Canaveral, so the west-coast Vandenberg Air Force Base is used instead to launch these missions. 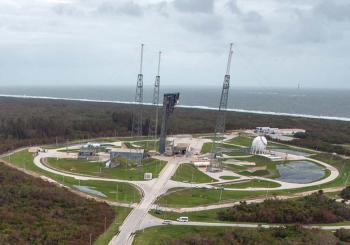 Notices to Airmen (NOTAMS), warnings issued to alert pilots to airspace restrictions and hazards posed by the launch, show that the rocket will take an easterly trajectory away from Cape Canaveral over the Atlantic Ocean. This course is consistent with an equatorial orbit and hazard areas announced align closely with those for the NROL-61 mission that launched last July. The most commonly-used form of equatorial orbit is a geostationary orbit, where the satellite takes exactly one sidereal day to complete an orbit – matching the rotation of the Earth so as to remain constantly over the same point on the surface. Atlas can inject a satellite directly into geostationary orbit, or into a transfer orbit (GTO) from which the spacecraft would circularise its orbit under its own propulsion. NROL-61 was placed into a geostationary transfer orbit. The Atlas V rocket that lofted NROL-52 flew in the 421 configuration, with a four-meter payload fairing and two AJ-60A solid rocket motors providing additional thrust at liftoff. Depending on the mass of its payload and the impulse (or delta-v) required to reach the desired orbit, Atlas can fly with between zero and five boosters. Fairings with diameters of four and five meters (13 and 16 feet) are available, with three different lengths available for each size. The standard four-meter fairing, named the Long Payload Fairing (LPF), measures 12.2 meters (40 feet) in length and was first introduced as an optional larger fairing for the Atlas I rocket in 1990. One or two 90-centimetre (3-foot) cylindrical segments can be added to the fairing to form an Extended Payload Fairing (EPF) or Extra-Extended Payload Fairing (XEPF) respectively for payloads that require the additional space. This launch will use the 14-metre-long (46 ft) XEPF. Last year’s NROL-61 launch also used an Atlas V 421 with an XEPF fairing, so this launch is likely carrying the same type of payload to a similar orbit. 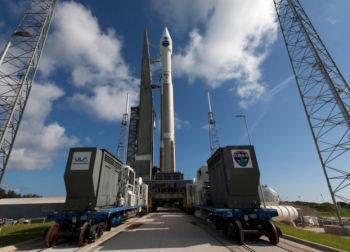 No other NRO missions have used the Atlas V 421. It has been speculated that NROL-61 was the first satellite in a new generation of the NRO’s data relay constellation, the Satellite Data System (SDS) or Quasar. Quasar satellites receive data from other NRO spacecraft – particularly the large Crystal imaging satellites – and transmit it back to ground stations. The series began with the launch of the OPS 7837 aboard a Titan III(34)B rocket in June 1976, a few months before the first Crystal was deployed. SDS initially used satellites in inclined, elliptical Molniya orbits to allow data transmission from Crystal satellites as they passed over the Arctic. 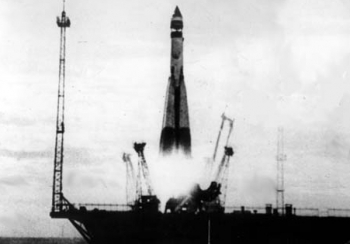 Between six and eight first-generation satellites were launched – the exact number is unclear as Jumpseat signals intelligence satellites were launched by the same type of rocket and also operated in Molniya orbit. Quasar’s second generation consisted of four or five satellites. The first of these, USA-40, was deployed from Space Shuttle Columbia during her STS-28 mission in 1989 with the aid of a solid-fuelled upper stage. The second spacecraft of this generation, USA-67, was deployed from Atlantis during 1990’s STS-38 mission. The first Quasar to operate in geostationary orbit, USA-67’s launch was used as cover for a more highly-classified spacecraft, Prowler, which had stealth capabilities. The two kick motors used to deploy these spacecraft led to observers believing that a two-stage Inertial Upper Stage (IUS) had been used to raise a single payload – then incorrectly identified as an Orion signals intelligence satellite – into geostationary orbit. 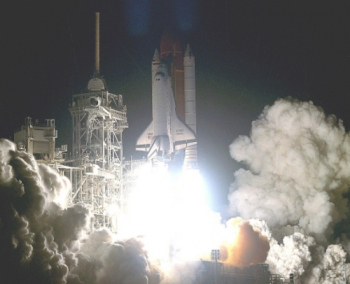 A further Molniya-orbit Quasar was deployed from the Space Shuttle during Discovery’s STS-53 mission in 1992, and in July 1996 another was launched aboard a Titan IV(405)A, also using a solid-fuelled kick motor. It is unclear whether USA-137, launched into Molniya orbit aboard an Atlas IIA in January 1998, was the last second-generation satellite or the first in a new third generation. An additional second-generation satellite was built but not launched – this has since been donated to NASA to form the basis of a future scientific mission. Two Atlas IIAS launches in December 2000 and October 2001 carried geostationary Quasar satellites, before the final Atlas II launch – also using the IIAS configuration – carried to orbit another Molniya satellite in August 2004. With the Atlas II’s retirement, Quasar launches switched to Evolved Expendable Launch Vehicles (EELVs) – the Atlas V and Delta IV. The most recent Molniya-orbit launch occurred in December 2007, using an Atlas V 401. Between 2011 and 2014, three more third-generation geostationary third-generation Quasars were deployed – one aboard a Delta IV Medium+(4,2) and the other two aboard Atlas V 401s. With no Molniya-orbit satellites having launched in almost ten years, it is not clear whether this part of the constellation is still being maintained. The use of the more powerful Atlas V 421 over the Atlas V 401 for the NROL-61 and NROL-52 launches suggests a new fourth-generation satellite that is heavier than its predecessors, while the use of the extra-extended fairing instead of the Long Payload Fairing that was used for third-generation Quasars, indicates that the new spacecraft are also physically larger or carry bigger antennae. United Launch Alliance (ULA) performed the launch. Formed in December 2006, ULA took over operations of the Atlas V rocket from Lockheed Martin and the Delta II and Delta IV from Boeing. The company markets launch services to US Government customers and conducts commercial launches under subcontract from Lockheed and Boeing. 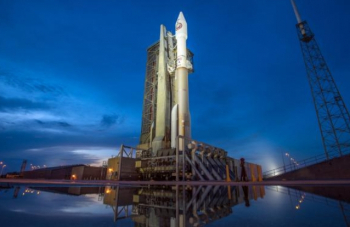 ULA has conducted over 100 successful launches since its formation, with the only blemish on its reliability record a partial failure during the 2007 Atlas V launch of NROL-30. On that mission a lower-than-planned orbit was achieved after a faulty valve allowed hydrogen propellant to leak from the rocket’s upper stage during a coast phase. The payload was able to correct its own orbit and conduct an apparently-successful mission regardless. The launch took place from Space Launch Complex 41 (SLC-41) at the Cape Canaveral Air Force Station. A former Titan III and later Titan IV launch complex, SLC-41 was redeveloped for the Atlas V between 1999 and the Atlas’ maiden flight in 2002. It replaced Space Launch Complex 36 (SLC-36), which had been used by earlier Atlas-Centaur, Atlas I, II and III rockets since the 1960s. Atlas V rockets launched from SLC-41 are assembled vertically in the nearby Vertical Integration Facility, before being rolled to the pad atop a mobile launch platform. 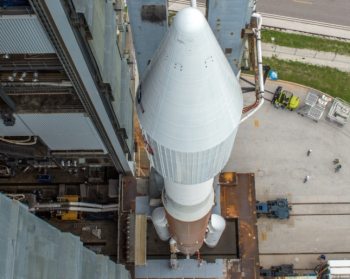 Ahead of this launch, Atlas was rolled out to the pad. 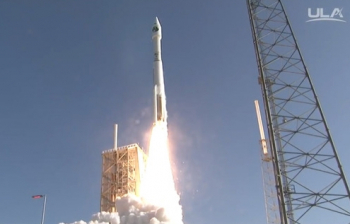 The Atlas V that launched NROL-52 had tail number AV-075. Flying in the 421 configuration it consists of a Common Core Booster (CCB) first stage, two Aerojet Rocketdyne AJ-60A solid rocket motors, a single-engine Centaur upper stage and the four-meter Extra-Extended Payload Fairing (XEPF). The Common Core Booster burns RP-1 kerosene propellant, oxidized by liquid oxygen. Centaur burns liquid hydrogen and liquid oxygen. About 2.7 seconds before Atlas’ planned launch time the first stage’s single RD-180 engine ignite. Ignition of the solid rocket motors and liftoff of the rocket followed at about 1.1 seconds after the zero mark in the countdown. AV-075 lifted off from SLC-41 and begin her ascent towards orbit, beginning a series of pitch, roll and yaw maneuvers to attain the planned launch trajectory shortly after liftoff. About 47 seconds into the flight Atlas reache Mach 1 – the speed of sound – passing through the area of maximum dynamic pressure – or Max-Q – five seconds later. The boosters burned for the first 91 seconds of flight before depleting their propellant and burning out. The spent motors jettisoned 38 seconds later, two minutes and nine seconds into the flight. Following burnout of the boosters, the CCB’s RD-180 engine continued to power Atlas towards orbit. RD-180 cutoff came four minutes and ten seconds after liftoff, with the Common Core Booster separating six seconds later. Ten seconds after stage separation, Centaur ignited its RL10C-1 engine to begin its first burn of the mission. Eight seconds later the payload fairing separated from the nose of the rocket. At this point, official coverage of the mission entered a news blackout, except for confirmation of a successful launch following spacecraft separation. Centaur will likely make two burns prior to spacecraft separation, with its first lasting about eleven minutes to establish an initial parking orbit. Following a coast of about ten minutes, Centaur will restart its engine for a second burn of about four minutes to reach geostationary transfer orbit. Shortly after this burn concludes, the NROL-52 payload will separate from Centaur. The deployment orbit is expected to be around 1,100 by 35,800 kilometers (680 by 22,200 miles, 590 by 19,300 nautical miles), with inclination of about 18.7 degrees. Following spacecraft separation, Centaur will make a further burn to deorbit itself, with reentry expected to occur over the Pacific Ocean, to the south of Hawaii. 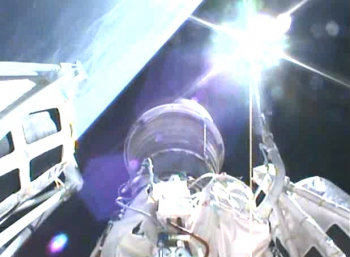 ULA later confirmed the mission was a success. The launch was sixth and final Atlas V launch of 2017, as well as being the seventh launch of the year for United Launch Alliance and the fourth for the National Reconnaissance Office. ULA will next be in action on 10 November when the company’s venerable Delta II rocket will deploy the JPSS-1 weather satellite for the National Oceanic and Atmospheric Administration (NOAA), before the company’s final launch of the year on 13 December carries another NRO payload, NROL-47, aboard a Delta IV. Three of Atlas’ missions this year have carried NRO payloads – in addition to this NROL-52 launch, the NROL-42 mission late last month deployed a signals intelligence satellite and before that March’s NROL-79 mission deployed a pair of Intruder satellites to monitor the positions of ships at sea from their radio transmissions. The first Atlas V launch of the year occurred on 21 January, when the rocket deployed the third geostationary missile detection satellite of the Space Based Infrared System (SBIRS) program. The rocket’s two other missions in 2017 carried Orbital ATK’s OA-7 Cygnus mission on the first leg of a mission to resupply the International Space Station in April, and NASA’s TDRS-M communications satellite in August. The next Atlas launch is currently scheduled for no earlier than 18 January, beginning 2018 as it began 2017 with the launch of a SBIRS satellite, SBIRS-GEO-4. NROL-52 is expected to lift off hours after the sixtieth anniversary of the world’s first orbital launch. At 19:28 UTC on Friday, 4 October 1957 the Soviet Union launched a modified R-7 missile from Site 1/5 at what is now the Baikonur Cosmodrome, carrying the Prosteyshiy Sputnik 1 (PS-1 – commonly known as Sputnik 1) satellite into low Earth orbit. Since then over 5,000 launches have reached orbit and many other attempts have fallen short. Ten countries – the Soviet Union, United States, France, Japan, the People’s Republic of China, the United Kingdom, India, Israel, Iran and North Korea – a European multinational partnership and private companies have developed rockets capable of launching satellites, while many more countries have launched their spacecraft aboard other nations’ rockets. Spacecraft have visited all of the planets of the Solar System, humans have walked upon the moon and undertaken complex and long-term missions in Earth orbit in collaboration between many nations. With companies like SpaceX revolutionising the space launch industry and making plans to put humans on Mars in the coming decades, China making progress with its space station program and NASA developing its Space Launch System and Deep Space Gateway to enable human exploration beyond Earth orbit, the face of space exploration could change as much in the next sixty years as it has in the last sixty.